TIHA 5th Annual "Show & Go"
offers buyers assurances that they are buying a genuine well produced Traditional Irish Horse. 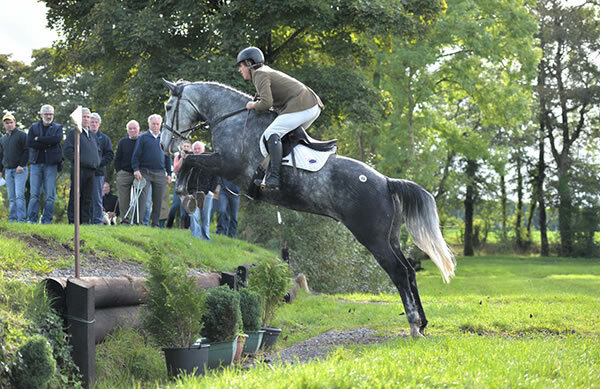 “This is a very talented horse with lovely movement and scopey jump. He has been ridden sidesaddle. “Handsome is a big old style Irish draught gelding that has 3 seasons hunting done with various packs. huntsman or with the rest of the field. He hunted with Scarteen Hunt & Old Mill Foxhounds on occasion. Sales are held subject to the following conditions. These conditions form the basis of the Contract between the Purchaser and Vendor. must be presented to the vet within 30 minutes thereafter. shown any evidence of sweet itch or any vice whatsoever must be declared as such by the Vendor. way held responsible for the description of any Lot. animal which is suspected to be suffering from a contagious disease. 10. No animals will be permitted entry to sales ground on day of sale without a passport. 11. Animals not entered in catalogue are not permitted in sales grounds. ring and that vendors state a maximum reserve price to the auctioneers on the morning of the sales. Equestrian Horse Sales Ltd may not be sold by the vendor before the auction of that lot. Ltd in the interest of their own personal safety as this practice is taken solely at the riders' own risk. 14. Riders must wear correct protective clothing including safety helmet. knocked down, and shall immediately pay the purchase price, by CASH or CREDIT / DEBIT CARD. Cheques will not be accepted unless agreed with management prior to the sale. the hammer, or from the time of sale if sold privately. the evening of the sale of the day of purchase. 20. All animals remain the property of the vendor until paid in full. information being supplied by the Vendor who alone is responsible for the accuracy. 24. Money shall not be paid to the Vendor of any Lot unless the Lot is cleared by the Purchaser. animals where payment has been received. 26. No entries shall be accepted unless accompanied by the appropriate entry fee. 27. Sales entry fees are non refundable. 28. All animals must be haltered, managed, showed and led by a capable person aged 16 years or over. 29. All stallions and colts over 2 years must be shown in a bridle. 30. Catalogue placings are strictly on first come first served basis. 32. CHEQUES WILL NOT BE ACCEPTED as payment, unless agreed in advance of sale with management. 33. PAYMENT BY CASH, VISA DEBIT CARD, VISA/CREDIT CARDS OR BANK TRANSFER ONLY. 34. Visa/Credit Cards and non-ROI Debit Cards are subject to a 2.5% surcharge. 35. ROI Personal Debit Card transactions are subject to a surcharge of 1.0%. children are your responsibility and must be kept under supervision by a parent or guardian at all times.